Mindset barriers often arise when aspiring cookbook authors start to define their cookbook concept. Here are a few common obstacles that crop up related to cookbook concept development and some suggestions for overcoming the obstacles. My goal is to make money, a lot of money. This has to be worth all the effort. How do I choose a topic that sells? Pick a topic with “legs.” Look at food trends, but ultimately select a concept that will be relevant after your book is published. It may take 18 months from idea to publication for a trade or traditionally published cookbook, so select a topic that fits this timeline. Self-publishing your cookbook might not take that long, but you still want the topic to be relevant. Also, pick a topic that your audience engages with and refers to over and over. Think about it: the customer’s relationship with a cookbook isn’t linear like it is with a novel. A well-written cookbook becomes a favorite cookbook and is cooked from over and over again. That should be your goal. I have a unique idea, but I’m worried I’ve waited too long and the market is saturated with books similar to the one I want to write. Pick a topic where a new voice (your voice) will be a welcome addition to the other books out there on a similar topic. Many topics of cookbooks are always popular, and your topic, with your unique twist, can be attractive and relevant even with other books published on the same topic. How many Italian cooking books or cookie cookbooks are out there? There are a lot. And they sell. Don’t let other books with similar concepts stop you. An idea that’s not strictly unique can sell very well. A book coach, agent or editor will help you shape your idea into a usable, salable cookbook. I want to connect with my readers, but how do I figure out what they want? This does require research and hopefully a connection with readers before writing your book. What you need to determine is if there is room for your idea with you as the author. Research is necessary but has to be finite, because sometimes excessive research is a sign of fear to get started with the project. Research involves studying cookbooks, food blogs, and DIY sites that present a concept similar to your idea. Determine how you will differentiate yourself. Once you complete a reasonable amount of research, then stop the research and take action. Select your concept and get started. Pitch the idea to an agent or editor. I want my book to sound like me. How do I find a unique theme/voice? Pretend you are helping one person – what would you tell them about your topic and why? Write your concept in your own words, using the way you would explain something as your guide. Some writers speak their concept or ideas into a voice recorder and then have the recording transcribed. Then it sounds like them. When a reader reads your work, you want them to be able to hear you in the text and words. Your voice and words will be unique because they come from you. Is My Cookbook Concept Good Enough? Cookbook author, editor, and Culinary Dietitian Maggie Green coaches aspiring cookbook authors during the pre-publication phase of writing a cookbook. 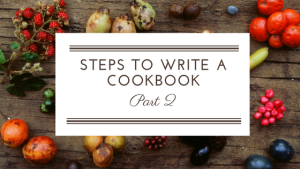 If you want to write a cookbook, and wonder if you’re ready, download her 11-point checklist Am I Ready to Write a Cookbook?